Chris Sturgill, a manager, gave a key note presentation about how REV policies are enabling distributed energy resource (DER) providers. The presentation described the shift in REV policies from frameworks to implementation and described the latest rules for the various types of DERs. 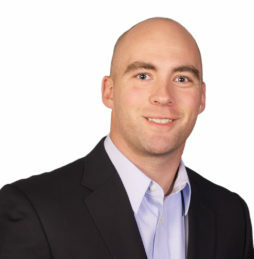 Josh Kmiec, a manager, moderated a panel comparing the progress that has been made in New York to that of other states, like Illinois and Massachusetts, with similar initiatives. Kevin Hernandez, a director, moderated a panel on how new business models and technologies being tested through REV demonstration projects can scale up to become a business as usual part of utility operations. The REV initiative is arguably one of the most sweeping policy reforms ever undertaken in the electric industry. Through REV, the New York Public Service Commission has enacted policies to enable the greater adoption of all types of DERs from distributed generation, like rooftop solar, to energy efficiency, and more recently energy storage and electric vehicles (EV) (shown on the left-hand side of the figure below). The sweeping nature of the REV initiative has led it to undertake many topics of regulatory reform simultaneously. In some areas, like non-wire alternatives, this has worked to advance policy objectives and potentially reduce traditional capital infrastructure through the use of non-traditional resources. In others, this aggressive push has created ambiguity in policy that has taken significant effort to clarify (shown on the right-hand side of the figure below). 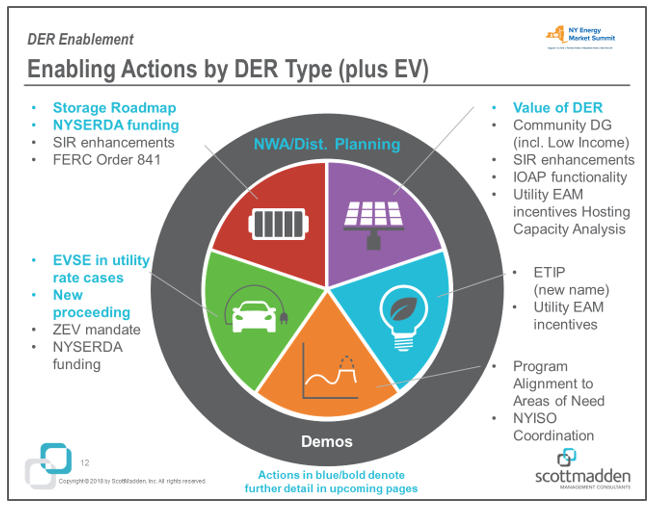 Policy actions expected in the near future include the continued evolution of the Value of DER, New York’s Energy Storage Roadmap, and a new Commission proceeding to define the utility’s role in deploying EV supply equipment. As part of the 2014 REV Track One Order, each investor-owned utility in New York state was directed to engage in demonstration projects aimed at “demonstrating new business models, developing DSP functionalities, measuring customer response to programs and prices associated with REV markets, and determining the most effective implementation of DER.” Demonstration projects provide an opportunity to test new technologies before deploying them at scale and also help identify the kinds of price signals, tariff structures, data needs, and consumer protections needed to implement solutions. According to the latest distributed system implementation plan filings made on July 31, 2018, there were more than two dozen demonstration projects underway in New York state as part of REV, covering everything from rate designs to maximizing DER export technologies to smart cities. However, questions remain over how to leverage project learnings across utilities and how to scale demonstration projects to become fully integrated into utilities’ operations. ScottMadden has taken a detailed look at the regulatory frameworks, policies, and utility actions in Massachusetts and Illinois. This background was instrumental as we facilitated a panel comparing and contrasting the actions taken in New York against these two states. States tend to adopt different approaches, levels of focus, and pace as they relate to issues, such as decarbonization, grid modernization, and the integration of DERs. For instance, Illinois had a similarly low penetration of DERs; however, rather than focusing on policy to incent greater DER adoption, it set legislative policy to invest heavily in foundational infrastructure, such as advanced metering infrastructure, in order to enable more capabilities today and be prepared for DERs when adoption increases. As regulatory reforms continue to unfold across the United States, actions taken by various states will serve as lessons learned for other states, of both successes and setbacks, with New York having early examples of both. As the implementation of REV continues, it will tackle issues at the center of an evolving utility business model, such as how DERs are valued, how utilities and new partners will collaborate to provide energy services, and how to cost effectively incentivize greater DER penetration. The resolution of these issues will have ripples across the industry. At the same time, many of the policies driving these changes are continuing to evolve creating implementation challenges for New York’s utilities. 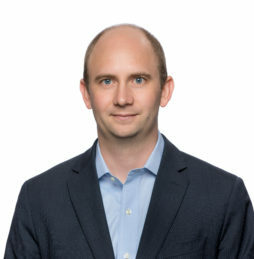 At ScottMadden, we have a front row seat to this shifting landscape and bring a thorough understanding of the related opportunities and challenges that we can share with our clients. For more information about the grid transformation and our work in this space, please contact us. 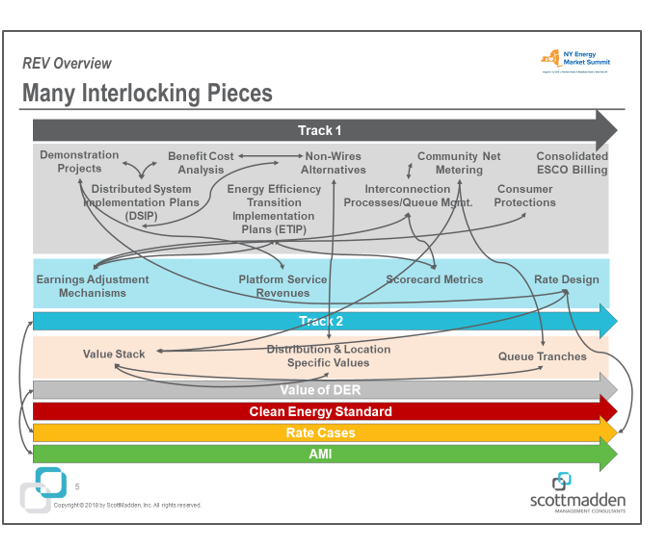 New York regulators critically evaluate Distributed System Implementation Plans, a foundational element of the Reforming the Energy Vision proceeding. Learn about the next steps and key implications in this Grid Minute.